Funnelling into the warm confines of Place Bell from a piercingly cold December night, thousands assembled for an evening with Ghost in Montreal; many were costumed, with painted faces resembling iterations of lead singer Papa Emeritus. Cones of incenses spewed tendrils of aromatic smoke from the stage and the haunting chants of Gregorio Allegri's "Miserere Mei, Deus" played over the PA while fans shrieked and howled in anticipation. Seven members of the band, "The Nameless Ghouls," crept out and took their spots upon a large stone platform and staircase cast before three enormous stained glass windows depicting scenes, and perhaps lending hints to the evolving band mythos. Launching into the two opening tracks from their Grammy-nominated 2018 release Prequelle, the band's current frontman Cardinal Copia (played by Tobias Forge) joined the band as they launched into "Rats." The set spanned the four-album career of the band, and saw vintage tracks like "Ritual" and "Satan Prayer" from 2010's Opus Eponymous intermingle with a heavy dose of eight tracks from their most recent album. A front half of what would be a two-hour set showcased some incredible performances, including a beautiful rendition of "Life Eternal" from their latest work, and a stunning presentation of "Cirice" from 2015's Meliora. The proggy six-minute instrumental piece "Miasma" was amazing, at times reminiscent of a Rush instrumental, a serious and consummate performance that ended on a lighter note as an obscure member of Ghost, the ancient Satanic pope-type character Papa Nihil, arrived in a plume of smoke to belt out an impressive saxophone solo. The second set saw equally impressive bright spots and even crowd surfing. Meliora's "From the Pinnacle to the Pit" saw pretty much every fan in the entire arena throwing fists into the air and singing in unison. "Year Zero" was arguably the best performance and most fan-engaging on the night, while "He Is" was simply stunning and tender, perhaps the epitome of satanic lyrics and band mythology of the evening. Tobias Forge spent plenty of time interacting with the crowd; often it was humble or hilarious, other times it dragged on far too long and the humour was lost. At one moment, he pointed into the raucous crowd and said "stop clapping" and within a split second the entire crowd had obeyed — it was eerie, like some sort of mentalism trick. He also reminisced about the band's history in Montreal, pondering on "all those nights we spent together at Metropolis yeah?" Near the end of show, he stopped to speak about and introduce every one of the masked anonymous Nameless Ghouls, referring to each of them only as "Ghoul!" The well-teased encore performance of "Monstrace Clock" from 2013's Infestissumam was simply jaw-dropping and had thousands of fans singing in perfect unison: "Come together, together as one! Come together for Lucifer's son!" Despite so much terrific music however, there certainly was room for improvement as well. The band really do have an impressive number of amazing songs in their four-album career, yet a small handful really did feel like filler; a more concise set might have been even better. 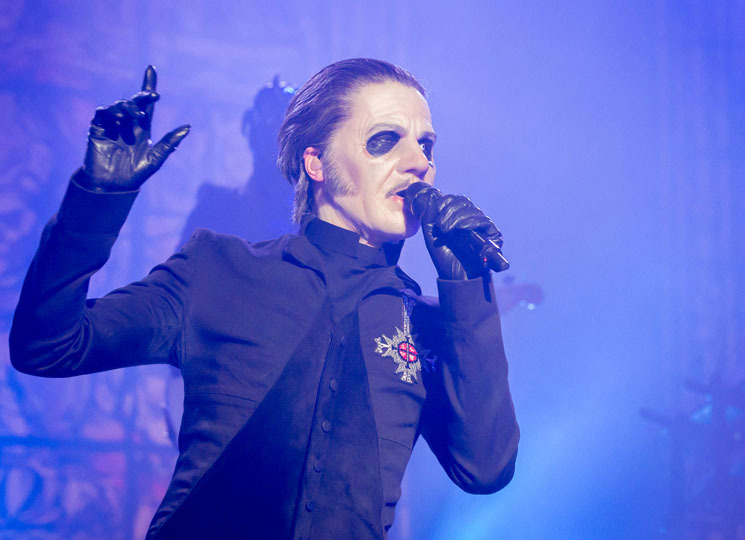 Also, of all the cooler iterations of a lead singer, this Cardinal Copia character looks like some boring old European dude at a cafe, and even makeup and wardrobe is pretty lifeless in comparison to the lumbering and impressively evil Papa Emeritus II. Perhaps at one point soon the Ghost Inc. marketing department will consider killing this character off and moving onto something more interesting.